Solar Aero Research, New Hampshire, has patented a bladeless wind turbine with a mesh-covered air inlet, which poses no danger to bats and birds. Nor will it disrupt radar used by air traffic controllers and the military. The Fuller Wind Turbine, developed over four years with £215,000 of private investment, harnesses the viscosity of air passing over the rims of thin discs to generate energy. Designed with urban rooftops in mind, the entire housing swivels almost silently as it tracks the wind – the only visible motion. “This enclosed turbine should produce significant power at half the life-cycle cost of the windmills,” says Howard Fuller, its inventor. The savings are due to the elimination of up-tower maintenance – to rebalance the blades of conventional wind turbines, for example. A proof of concept model exists and a prototype is expected to generate 10kW, with production units ranging from 5 to 100kW. An insignificant amount, perhaps, compared to a 3MW windmill, but – argues Fuller – power generation can be scaled up by grouping arrays more densely, with blade clearance no longer a concern. Nick Medic of Renewable UK (formerly the British Wind Energy Association) welcomed the innovation: “The fact that people are coming up with such a variety of solutions testifies to the vibrancy and viability of the wind energy market, and shows that there is a lot of potential”. 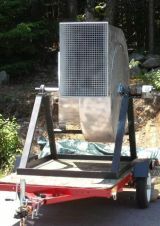 Whether the Fuller can boost micro-wind for the home remains to be seen. As Dale Vince of Ecotricity remarks, it’s “a huge challenge – nobody seems to have cracked it yet”. Solar Aero is seeking tax-deductible grants to develop the technology further. Manufacture will be licensed to franchisees, and Fuller expects “many thousands” to be made. The turbine's only rotating part is a turbine-driveshaft-alternator assembly, which cuts down on maintenance. The company says the Fuller can deliver power at a cost comparable to coal-fired power plants, or about 5 cents per kilowatt hour, GizMag says. Pricing and other details haven't been announced yet. The Fuller is still in development. I wonder how this model could/would compete against traditional systems, whether they be vertical or horizontal. It's sure to spark opinions and maybe critics, based on the old but improved design.